Typically pharmacy can sale to customers with discreet treatments for different health problems. What factors do families think when they are going to purchase any drugs? What about sexual breath and buy generic levitra? Certainly there are also other momentous questions. The most common sexual problems in men are ED and inhibited sexual desire. Where you can read more information about buy generic levitra online? This advice is common, but it can make all the difference if you need information about where to buy generic levitra. Because some of symptoms are medic emergencies, it’s considerable to know what to do if they happen. Talk to your physician about the proper removal of your medicine. This entry was posted on Wednesday, March 31st, 2010 at 8:47 pm and is filed under Polls. You can feed this entry. You can leave a response, or trackback from your own site. Just finished A Kiss to Kill today! Absolutely fantastic! A little scary there towards the end when I thought you-know-who really was going to be a baddie! I just couldn’t believe it! I gotta admit I didn’t see that betrayal coming. It hit me head on. That’s the way I like my books – when I’m kept on the edge of my seat until the end. Alex and Rebel = awesome couple – my favorite! This has been one of the best series I’ve read in a long time! Can’t wait to see what is coming from you next! what is the name of the book that catalogs the story of alex and rebel? Look for Alex and Rebel’s story in A Kiss To Kill, out in April :D.
I LOVED each couple equally, but for different reasons, so I just couldn’t choose. 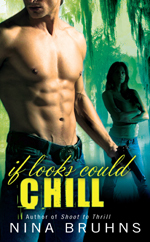 I picked up the 1st book (shoot to thrill) on a whim because I liked the cover (he’s hot, so sue me :wink:). I read it in 2 days (I work full-time, btw if that tells you anything). Couldn’t put it down. Same thing with the 2nd & 3rd books. You’re AWSOME! My favorite couple was not listed in the poll….Gina and Gregg.